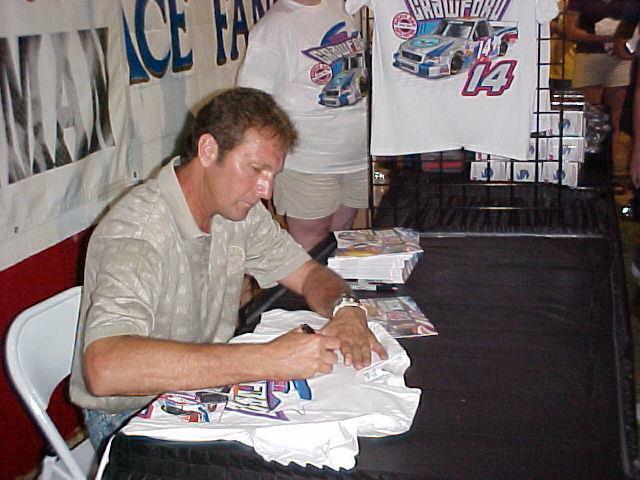 The fans turned out for Rick Crawford Night this past weekend at Mobile International Speedway. 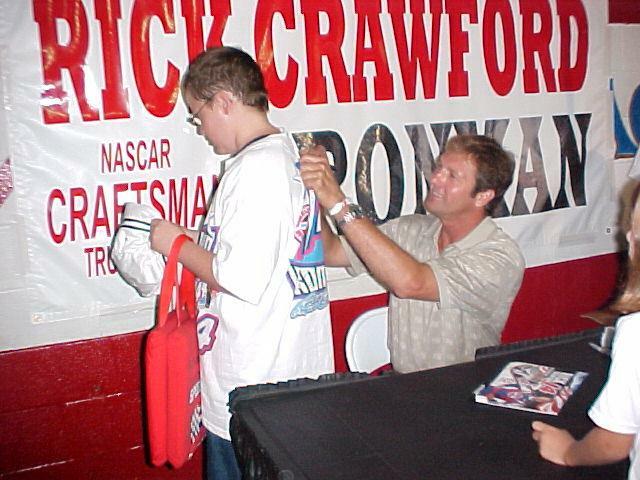 While Crawford has been known to show up in the pits to help old friends and watch some racing, it had been several years since Rick had an official autograph session. 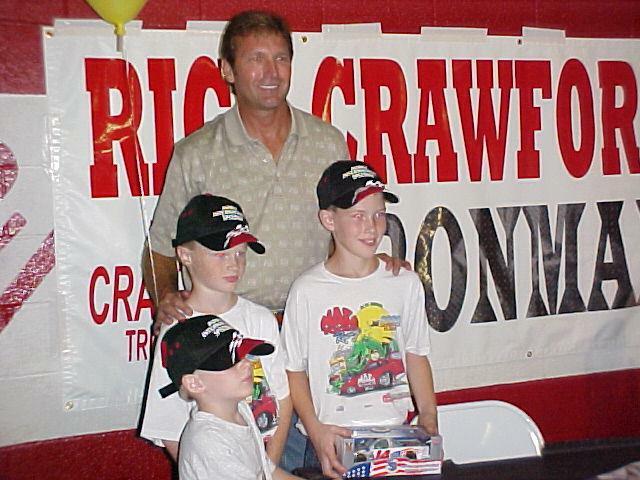 Crawford spent over 2 hours greeting fans and signing autographs. 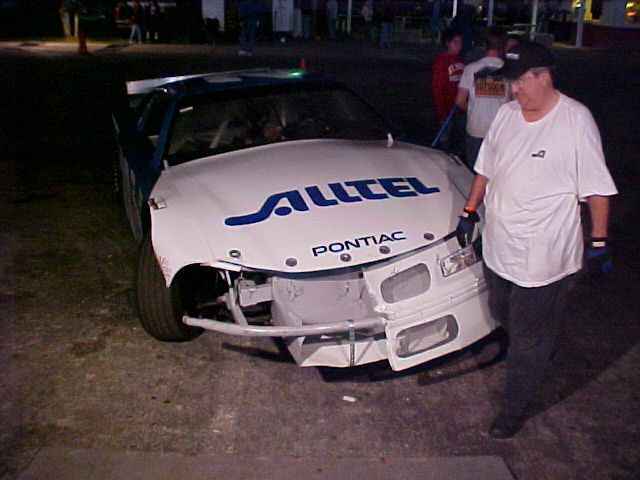 While Crawford's night went well in the stands the ALLTEL Pontiac was struggling on the race track. We put a new motor in on Friday and tested late Friday night. Our car was Ok but not great. On Saturday we changed everything under the car and barely made it to the track in time to qualify. We turned in a decent qualifying run but we new we had more ground to make up. Another set of changes made the car turn evil for the heat race and we went back to what we had for the feature. Two laps into the feature a water line broke on the car in front of us and put water on the track that sent us into a spin and then to the back of the field. While working our way back up, one of the guys behind us turned us around and we had to go to the back again. 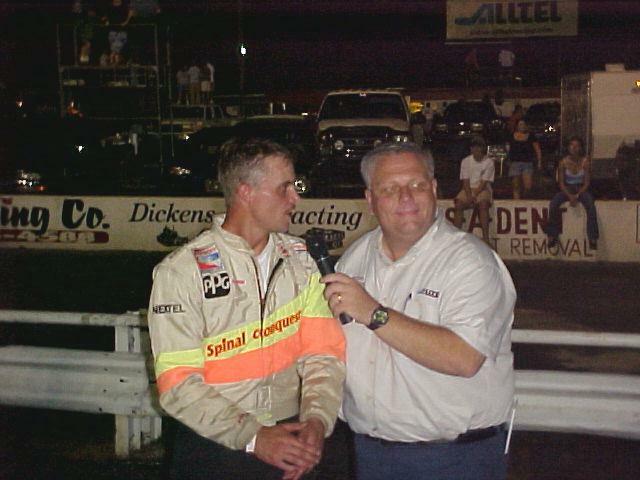 This wasn't the first time this guy had messed up our race car and when racing resumed I returned the favor and sent him for a ride to the hot dog stand in turn 3. As usual, 2 wrongs don't make a right and I was given the black flag and it ended our night. 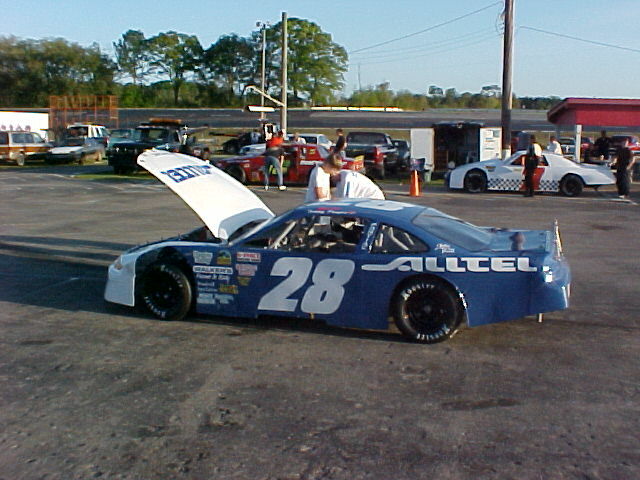 A hungry race team unloaded a specially tested ALLTEL Pontiac for our first night back at Pensacola Five Flags Speedway. Off the trailer the motor seemed sick and not quite performing up to the level we're use to. After our only practice session the guys went to work looking for the problem. They found several issues that were addressed including the timing being off and we hoped we had it ready. The field would line up by points and thanks to a dice roll invert we would start first. The race started and we didn't, the motor was sicker than we thought. We settled into 6th position for a few laps and the motor finally broke. The #7 valve broke, knocked a hole in the top of the piston and cracked the block. A short and very disappointing night. We've already started on a new motor and the motor guys tell me they are giving us more horse power. Thats pretty impressive considering we've always had the best motor program on the coast. For the record, in the thousands of laps we've turned in competition that's only the second motor we've lost during a race and the first since I was a rookie. Our motor guys are really awesome. We leave Pensacola disappointed again but at least I can walk upright this time. 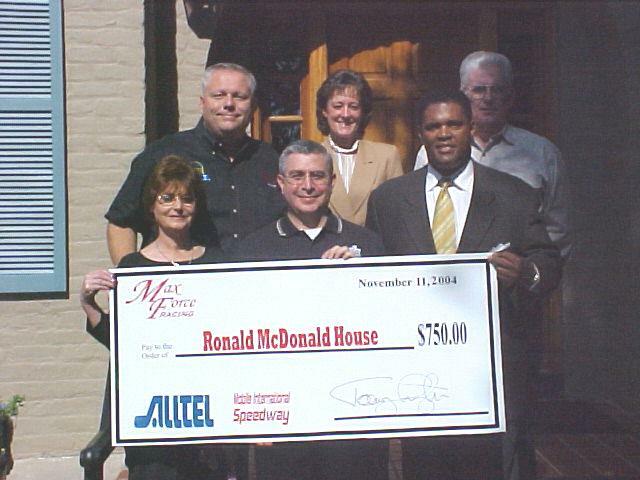 In front of the Ronald McDonald House delivering the proceeds from the first Ronald McDonald House Night at Mobile International Speedway. Front row l-r Ida Fields, owner of Mobile International Speedway, Anthony Martinez RMH, Marcus Elliott ALLTEL. Back row l-r Tommy, Celeste Van Hooser ALLTEL and Tom Claxton. Thanks to everyone who helped make it happen! 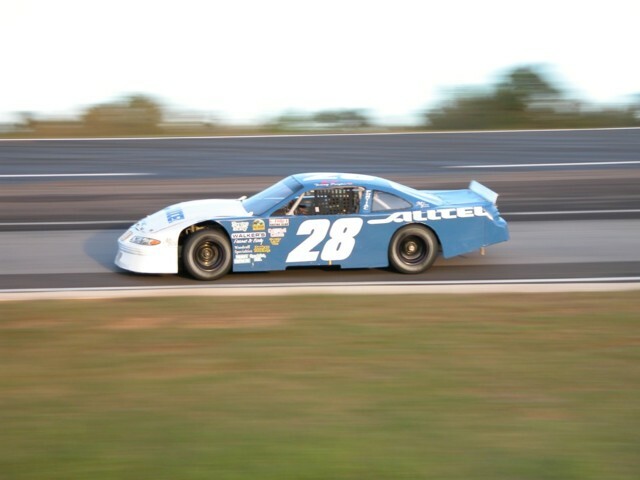 Team ALLTEL returned to racing last Saturday night at Mobile International Speedway for Ronald McDonald House Night and WOW! The previous week had been a 100 lap event and those races normally draw the biggest crowds. 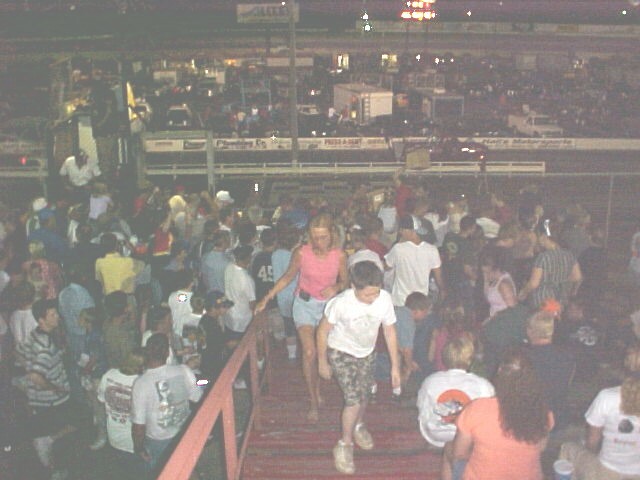 The fans came out big time for RMH Night and matched the 100 lap attendance making RMH Night one of the biggest crowds of 2004! Thanks to all the fans that came out and chipped in for RMH. After 3 or 4 months on the sidelines you expect to be a little rusty, your first night back. The rust on the driver wasn't too bad but the ALLTEL Pontiac had its share of problems. We tested 3 times for RMH Night and hoped we'd worked out all the problems, but we didn't get them all and the brake system gave us fits all night. That led to other handling problems that had the guys throwing everything at it to make it better. The car would work for a couple of laps and then the brake pedal would just go to the floor, not a good feeling. Even with everything going on we managed a top 5 qualifying effort that landed us on the pole in the heat race. At the drop of the green flag we opened up a 5 car length lead and after a couple of laps the brakes went away and we had to settle for second. In the feature we started on the outside of the front row and raced on the outside for several laps until the brakes went away and we were finally able to get down in the preferred groove in 8th. The race went green flag until the end and we ended up 5th. Not too bad but we were looking for more. The car doesn't have a scratch and we'll be ready for a double header weekend starting with 5 Flags Speedway in Pensacola on Friday, August 27th. Ronald McDonald House held its Fall Sports preview fund raiser at Carrabba's on Friday. 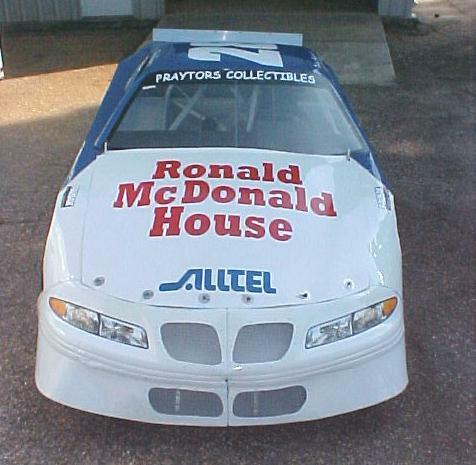 Team ALLTEL had the ALLTEL Pontiac with the Ronald McDonald House special paint scheme decked out for the luncheon. An overflow crowd was in attendance with WKRGs Randy Patrick as the featured speaker with an assist from the Mobile Bay Bears. The luncheon was the start of our count down to Ronald McDonald House night at Mobile International Speedway on August 7th. 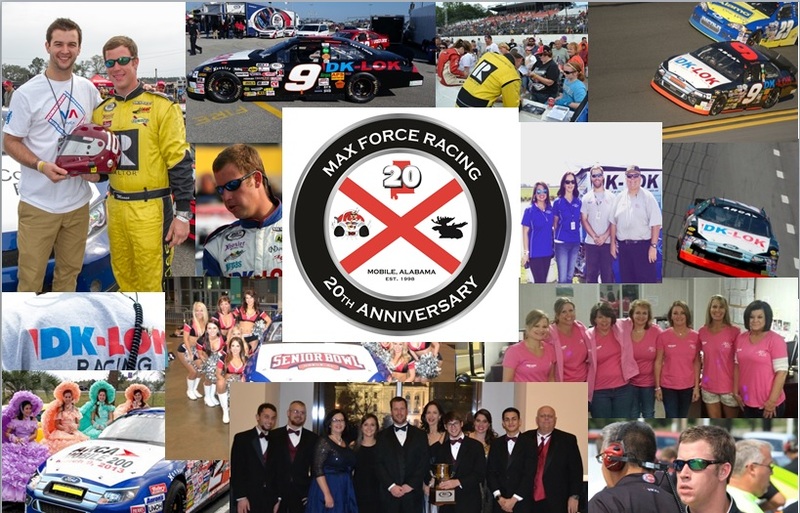 MOBILE -- Super Stock racecar driver Tommy Praytor of Max Force Racing will return to the Mobile International Speedway on Saturday, August 7th as part of "Ronald McDonald House Night". Praytor has pledged to donate his winnings to Mobile's Ronald McDonald House. Mobile International Speedway will match Praytor's contribution dollar-for-dollar. For Praytor, this race will be his first since he was injured in a wreck at Pensacola's Five Flags Speedway on April 2nd. The crash caused extensive damage to his ALLTEL Pontiac, as well as a broken back and other injuries to Praytor himself. Both Praytor and his Pontiac have undergone intense rehabilitation over the past four months to prepare for his return to racing. The track will open at 5 p.m. with racing starting at 8 p.m. Admission to the Speedway is $10 for adults and $9 for seniors and military personnel. Children 11 and under are free. During the intermission, Praytor, members of Team ALLTEL and volunteers from the Ronald McDonald House will giveaway die-cast cars, hats and t-shirts. Located at 1626 Springhill Ave., the Ronald McDonald House is Mobile's "House That Love Built," a temporary home-away-from-home for families whose children are receiving treatment for serious illnesses, injuries or premature birth at any Mobile area hospital. Since it's opening in February 2000, the 12-bedroom House has served more than 1,275 families from communities throughout southern Alabama and southeastern Mississippi. 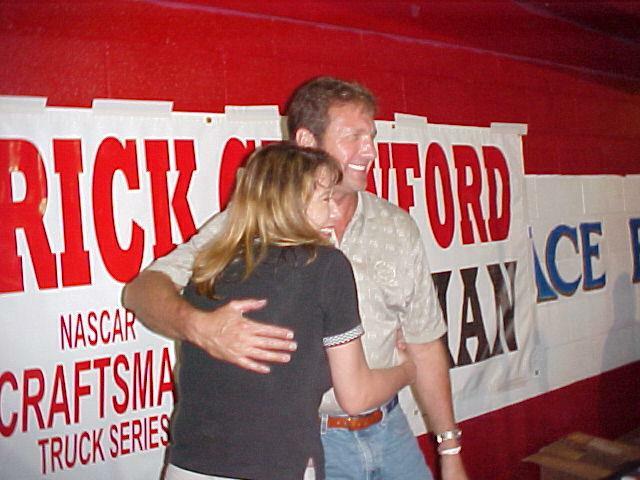 Praytor, owner of Praytor Animation, is the host of "Inside Alabama Racing" on WNSP-FM and appears Monday mornings on WPMI-TV NBC 15 to report on NASCAR racing news. 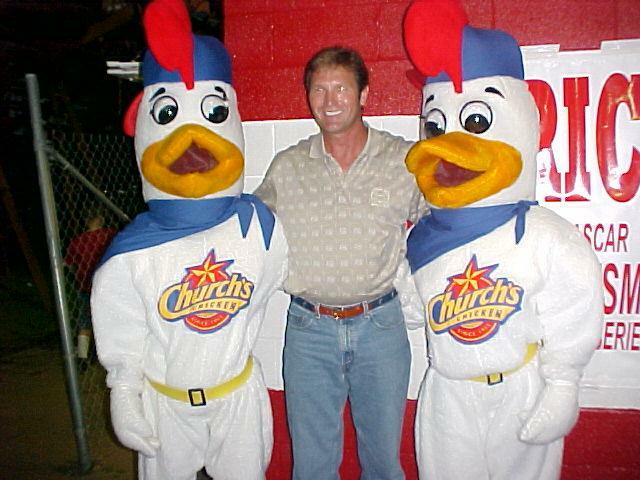 He is also a featured correspondent on the Outdoor Channel's "Raceline" program seen in more than 100 markets nationwide. Team ALLTEL has been working hard over the last 90 days to get the ALLTEL Pontiac back in shape after a wreck in Pensacola that left the car and driver in need of repair. 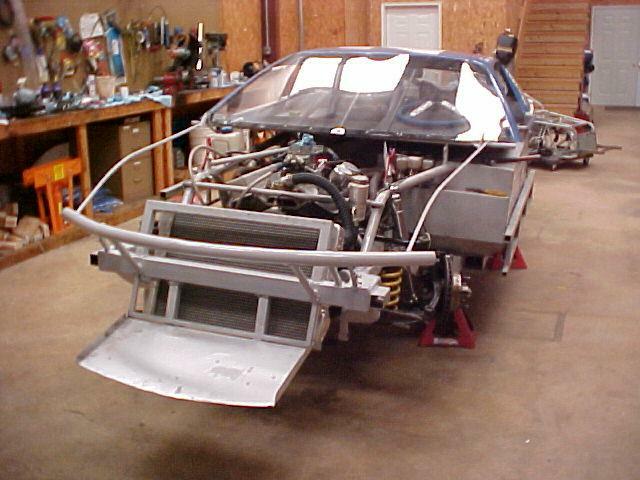 The car is almost complete and the driver has been rehabing over the last couple of weeks. The cure has been worse than the cause. Testing is slated for Thursday July 22nd and July 29th with a post testing Doctor clearence to return to racing. While our car and I have been under going rehab, the track has been nice enough to put me to work. 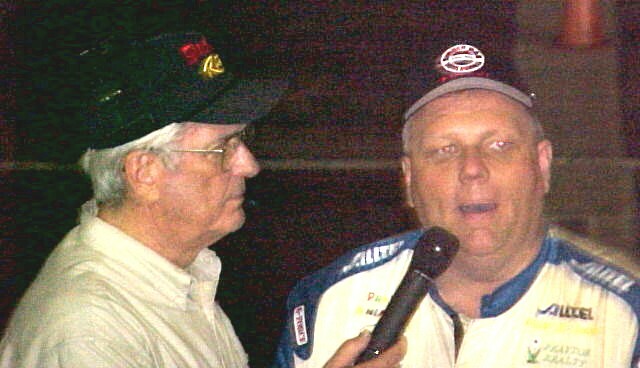 For the last few weeks I've been doing winner interviews in victory lane at Mobile International Speedway. This, along with my regular schedule at WNSP and NBC 15 have kept me busy. 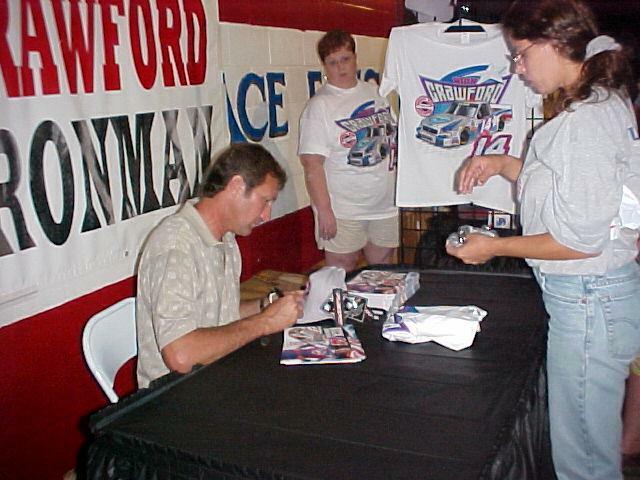 While talking about it, is a long way away from racing, its beats standing around like I've been doing. 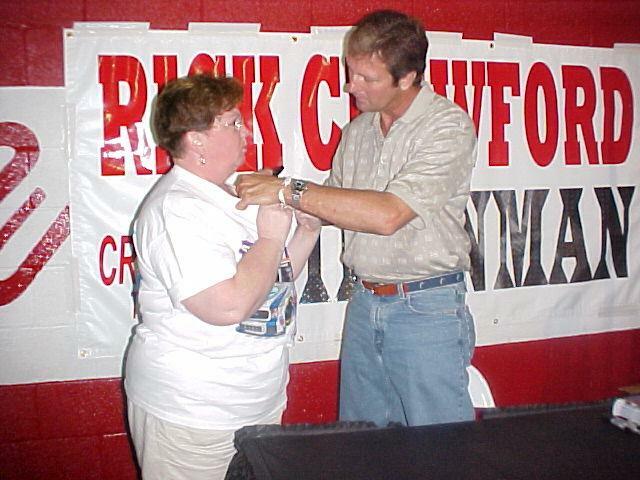 My broken chest and finger are healed up and the broken L-1 vertebrae is healing. I've started a minor rehab program that should turn heavy duty the first part of July. While the negotiations are still continuing with the doctors we are looking for a return to racing at the end of July, first part of August. My schedule is having a hard time matching theirs. Team ALLTEL Wins in Pensacola!!! 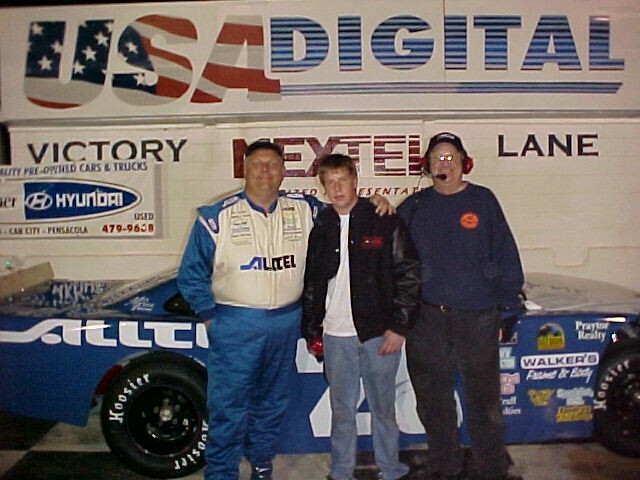 Pensacola 4-2-04-Having left a little on the table at Pensacola last year in the Snowball Derby, team ALLTEL was more than hungry on Friday night. Pensacola's race procedure is a little different from Mobile's, drivers draw for starting spot in the heat race and their finish in the heat is how they line up for the feature. Out of a bowl of 100 numbers we drew 100, we started dead last. The guys put together such a great car it didn't matter, we passed the last car on the final lap to take our first win in the new chassis and my first win ever at Pensacola. The first place finish should have put us on the pole for the feature. However, the first 6 positions of the feature are inverted by a number rolled on 1 dice, yep they rolled a 6, the most you can have, and we started 6th. From the drop of the green flag I felt like we had a winner, all we had to do was dodge the wrecks and pass 1 at a time. Five laps into the race we were spun out by another car and sent to the tail end. Our car was so good I was still confident we would win. Within 10 laps we were back up to 4th coming to another restart. The guys in front of us spun their tires on the start and I checked up to keep from hitting them, the guy behind me didn't. 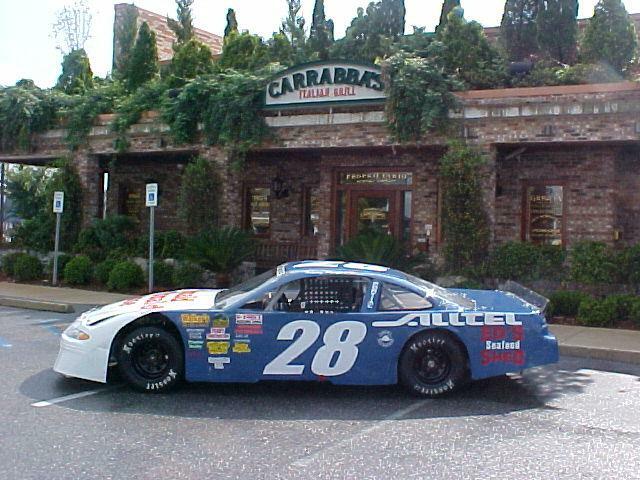 He hit the left rear of our car sending him airborne and our ALLTEL machine head first into the outside retaining wall. That was followed by every other car in the field piling into the mess on the front straight away. We were actually credited with a 5th place finish because it took out every other car left in the field but 1. I'm not going to say our car is destroyed but it's hurt really bad and will require several weeks work to get it back. Our driver is pretty beat up with a lower back injury being the worst part of the deal. A few days on my back should have me back. Unfortunately, we did not be make the second part of this weeks planned double header but we finally ended our winless streak at Pensacola Five Flags Speedway. 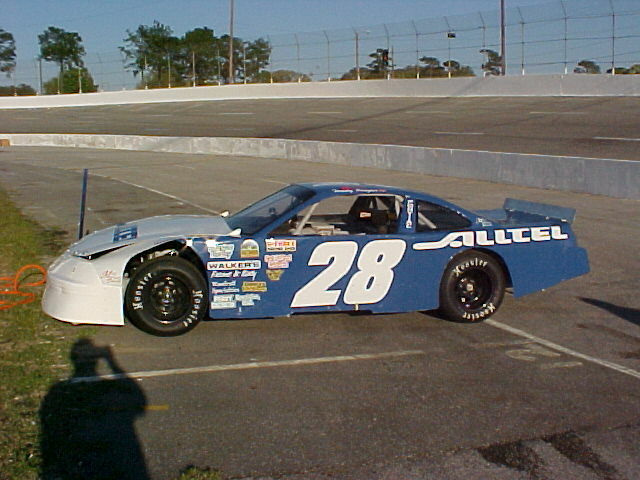 Two years in the making and hundreds of hours of work rolled on to the race track Saturday night at Mobile International Speedway for the debut of our 2004 ALLTEL Pontiac. Off the trailer the car was good and the team only made it better. Our qualifying time was the best I've ever posted and 4 tenths of a second faster than the best time of my career. Not only were we faster, but the competition hasn't stopped getting better either. Our time put us 4th, 2 100ths of a second off the front row. The team kept making changes throughout the night and we finished 2nd in the heat race. We started outside of the second row for the feature, a poor start by the car on the outside of the front row trapped us back in 6th. The race stayed green with no cautions and we were able to work our way back up to a 3rd place finish. OK, I knocked the nose piece off along the way (I do it so often we have a nose piece specialist, Tom Dabney, he can fix them in his sleep) but it was an awesome debut for a new race car. On track for a solid start to 2004. Ready to go for Season Opener at MIS. A little missing off the front Dabney will take care of it. 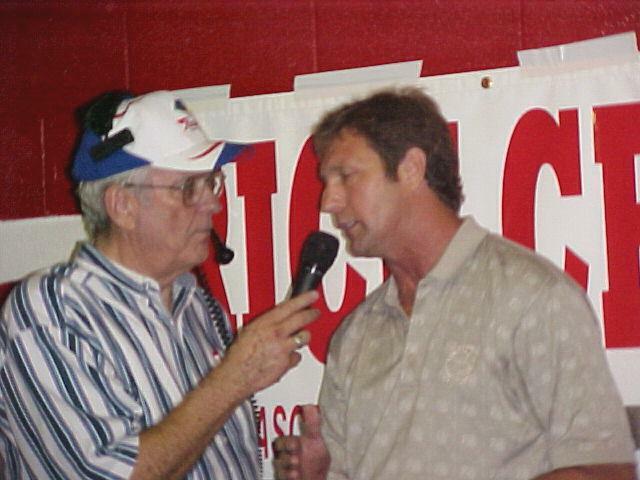 The 2004 local race season opens this weekend at Mobile International Speedway on Saturday night. 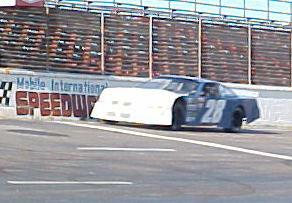 Team ALLTEL completed a successful test of the new 2004 Pontiac on Sunday. This week will see some final tweaking of the chassis and the ALLTEL stickers applied in anticipation of big start on opening night. We'll see you at the track Saturday night!